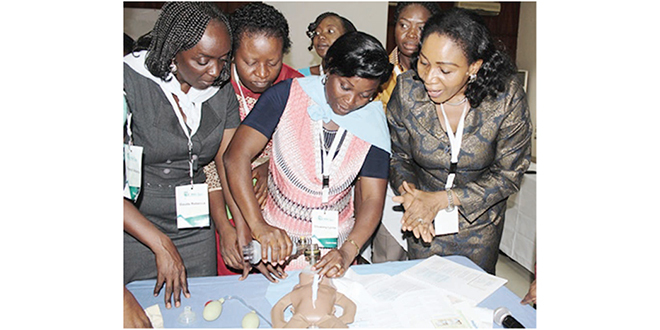 Fifty paramedics drawn from An­glophone countries of Central and West Africa are met from 18 to 21 this month at the maiden edition of the International Course in Applied Nu­trition organised by the Nestlé Nutrition Institute Africa. The theme of the train­ing was ‘The first 1000 days of life: Early Nutrition and long term health’. The meeting is in line with the com­mitment of Nestlé, one of the leading nu­trition, health and wellness company to provide education programmes for good nutrition and feeding practices and help healthcare professionals to have a greater impact on the nutritional aspects of care of future generations. In a statement from Nestlé Central & West Africa Region, Corporate Commu­nications & Public Affairs Department, Rizwan Yousuf, Category Manager, Nestlé Nutrition, Nestlé Nigeria, said: “We are convinced that good maternal nutrition during pregnancy, followed by exclusive breastfeeding during the first six months, is the best method to ensure a good start in life. Children who receive good nutri­tion in their first 1000 days are ten times more likely to resist the most common life threatening childhood diseases; complete more than four more grades at school; earn 21 per cent more wages as adults; have happier and healthier fami­lies as adults and contribute positively to the economic growth of the nation.” The International Course in Applied Nutrition (ICAN) is an initiative of the Nestlé Nutrition Institute Africa (NNIA) designed for paramedics. It is part of the institution’s training programmes that target healthcare professionals and which aim to share resources, research and training on maternal and child nutri­tion based on the latest scientific data. “Ogun State government has placed high priority on the nutrition of the vul­nerable group by supporting nutrition intervention programmes like the mater­nal newborn and child health week, the infant and young child feeding among others,” said Dr. Olaokun Soyinka, Com­missioner for Health, Ogun State, during the opening ceremony.